Visiting an archives has something in common with using any public service. In each interaction with a service or a staff person, you’re seeing the small tip of a very large iceberg. Behind-the-scenes people, tasks, and systems that you may never see all unite to affect the experience you’ll have. On this blog we’ve tried to give you a sense of what archival work is like, and how this might be reflected in your experience of using the rare or unpublished documents in archives. We’ve looked at how archivists appraise, select, organize, and describe records. Today we’ll pull back the curtain on another large component of archival work: reference service or working with archives users to provide access to archival records. There are some great guides out there for researchers planning to visit an archives (we’ve linked to some below). But in this post, we’d also like to reveal a little of what reference is like from our side of the desk. We hope that this will help you save time and avoid unnecessary frustration: if you know why things are the way they are, you can help us to help you. In a way, everything we do in archives is related to reference: the very reason we collect, preserve, and describe records is so that people can learn from them. And there’s no more rewarding part of our job than helping people find information about the past that solves their present-day problem or changes their view of themselves or the world. First, let’s look at some of the people and processes involved in reference. Then we’ll address what this means for us as archives workers and so for you as a researcher. Reference involves a meeting of minds: people who have questions come together with people who can guide them to sources for answers. And, don’t forget, everyone using the archives benefits from the minds of the past who speak to us through the records they have left behind. Staff who provide reference services in an archives can include archivists themselves as well as reference clerks, archives assistants, or reception staff. Reference also involves technical specialists who digitize analogue records or convert electronic records into special access copies. Researchers who use references services come from all walks of life, from students to seniors and from archeologists to artists. Inquirers may be writing book-length studies or they may be casually exploring a single historical fact. Of course the user group of a particular archives is partly determined by what the archives collects. For example, here at the Region of Peel Archives, one of our user groups includes government employees who are working to ensure our community runs fairly and smoothly. When and where does reference happen? In movies an archives-like storehouse is often a gloomy inner sanctum where a monkish guardian presides over mounds of books and manuscripts. This character is either zealously overprotective of his dusty charges or so vague that he leaves inquirers to rummage around by themselves. Sometimes fictional archivists even lend out documents. 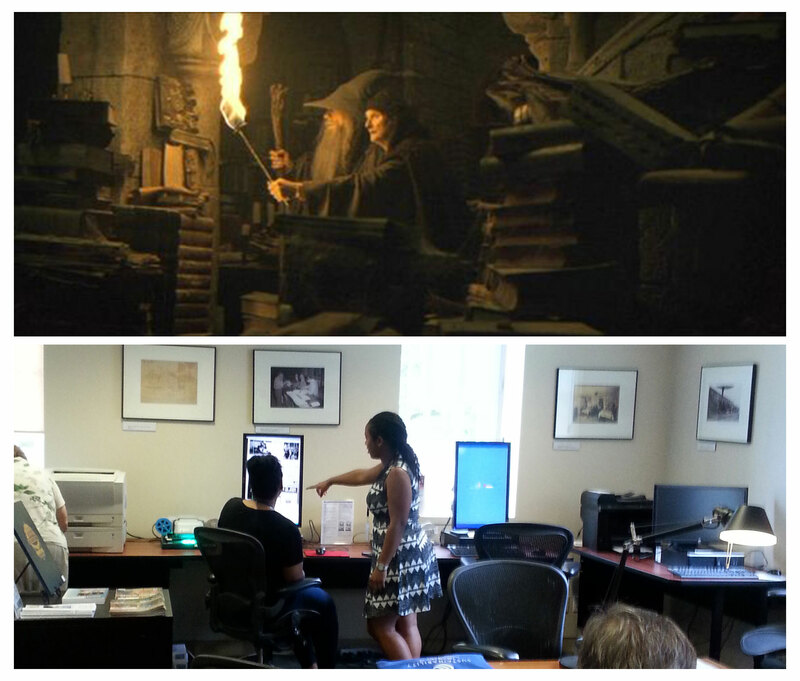 You and the archivist: fantasy (top) versus reality (bottom). At a distance without anyone conversing: by, say, posting material online along with the all-important information that tells you what (and why) it is; or by compiling and posting online research guides to common types of records. At a distance with lots of dialogue over email, phone, or even social media. 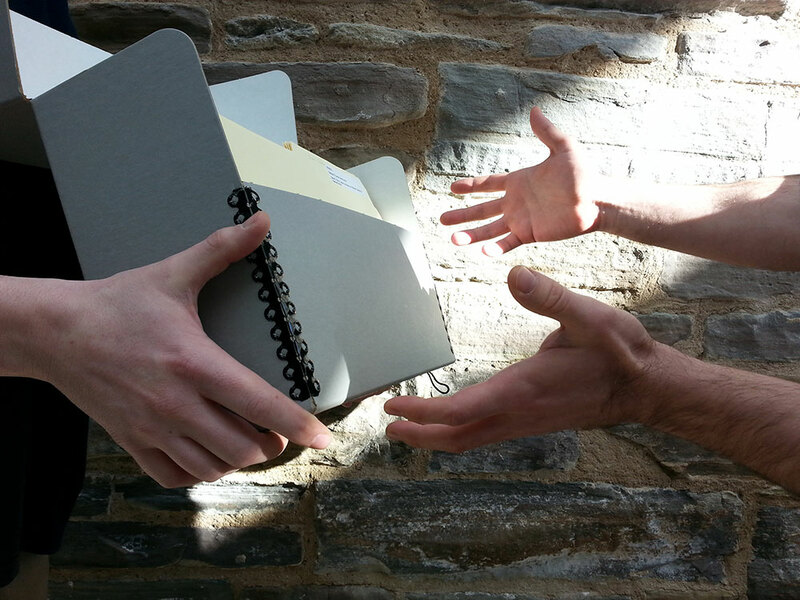 In person in the archival institution, by asking and answering questions, and by physically sharing access to documents. Regardless of the space – physical or cyber – in which archivists and researchers come together, they all happen in a place of privacy. Archives workers are professionally and ethically bound to treat your inquiry and all your information confidentially (unless you request otherwise). So why are reference services needed in the first place? There are two major reasons. One is to help archives users match their research inquiries with potentially useful archival material. The other is to mediate access to the records themselves. Just as in libraries, the world of archival information is vast and complex as are the systems used to organize and catalogue it. Staff who specialize in having a forest-and-trees sense of it help you explore and use it. Clarify and focus your research question to make it practicable. Find out what the archives holds. Use tools created by archives staff to navigate archives (finding aids, databases, and inventories). Understand the policies and services of the archives. Get ideas about other places you might look if the archives can’t help you. 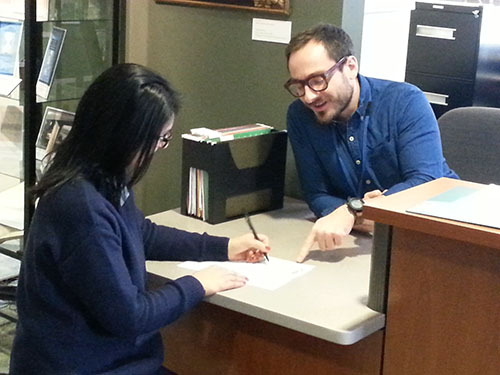 To use archival records in an archives, you’ll need to interact with a staff person. This can work to your advantage as you can talk through your research and get ideas about resources. Access to most archival records held by institutions is mediated and facilitated by staff – you can’t help yourself to records off the shelf or browse them casually. Instead you’ll need to work with staff to figure out what records to consult. Then staff will “retrieve” the records and bring them to you in a controlled space (often called a research room or reading room). This space is so well-monitored that before entering you’ll need to register as a researcher and agree to abide by a set of rules. Interpret general features of common types of records. Access and properly handle archival records. All these steps to gain access can make you feel as though you’re simply encountering obstacles. It might help to think of controlled access as pro-access: a little inconvenience now helps to ensure records are as available to future generations as they are to you. The closest you might come to a self-service model in the archival world happens when you’re using copies of records that archives staff have made available online. Since you can look at this material at any time, day or night, you might naturally think of this access as “easier.” It’s important to know, however, that bringing material to you in this way – with all its context and descriptions attached – requires a lot of labour that you can’t see. So while it’s true that the internet is changing the way we provide reference service for some records, nevertheless the majority of the world’s archival resources remain undigitized. Archival records are evidence of the activities they document. It’s therefore essential that they are not changed intentionally or accidently. Physical access to storage is therefore limited to staff who can supervise the integrity of records as they come and go (this is also why records can’t be loaned out). Archival records are rare and often one-of-a-kind and need to be carefully safeguarded against loss or damage. Storage facilities at the City of Toronto Archives. Archival records need to be maintained in certain physical conditions (such as particular temperatures and humidity levels) to maximize their longevity. It’s a lot easier to manage these variables in a controlled space. Records are sometimes stored “offsite” simply because of the logistics of storing massive volumes of material: sometimes appropriate extra storage may not be near optimal customer-friendly facilities. Here are some broad truths about the realities of archival research. 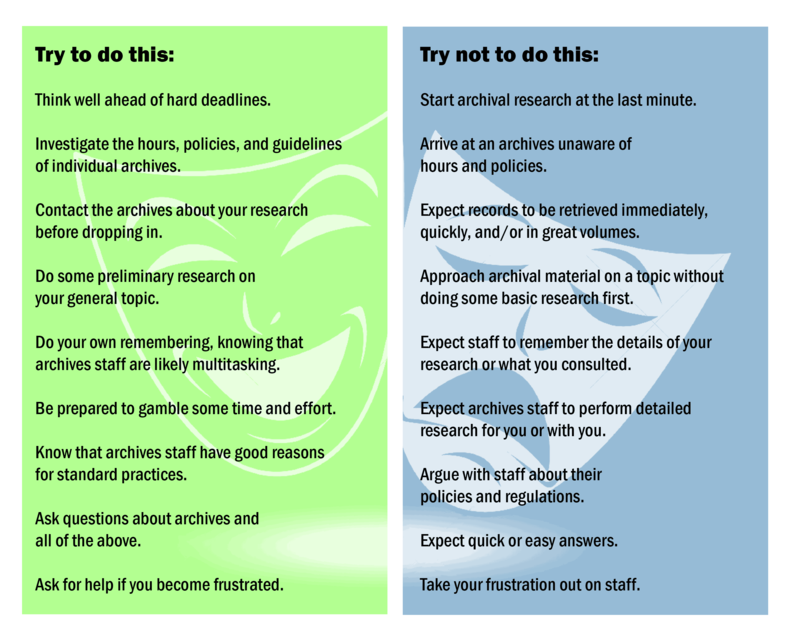 From these points flow some general do’s and don’ts for approaching an archives. First let’s look at what we’d really like you to know. Archival institutions are as unique as the records they hold (and the people who created those records). Yes, archival institutions share many practices (this blog has outlined widespread professional standards that unite archivists in a worldwide community). Archival uniqueness however, does mean that each institution specializes in particular topics. You’ll need to approach an institution that collects material on the topic you’re researching (though don’t worry about making a mistake – staff are generally glad to help you figure out a more appropriate institution to contact). Archives also differ widely in the scope of their facilities and staffing. 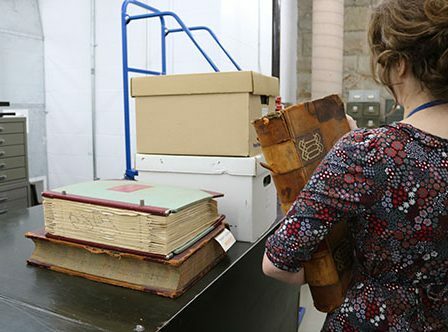 A provincial or national archives with hundreds of varied staff and hanger-size storage will operate very differently from a one-person shop with a small room of records. And it’s safe to say that regardless of size many archives are sparsely staffed – there is always more work to do than archivists to do it. Public hours vary enormously among archives. Some archives provide services – such photo printing, lunch rooms, or even an online catalogue – that others can’t. Some archives maintain restrictions that others don’t (such as bans on photography). Archives need varying lead times for retrievals. Work with each archives as you find it and resist the temptation to say, “But Archives X lets me do Y.” Above all, investigate and contact an archives before you travel there: their website is a good start. Find out not only what they have that might help you, but when they’re open, what to expect when you arrive, and what you might need to bring with you. 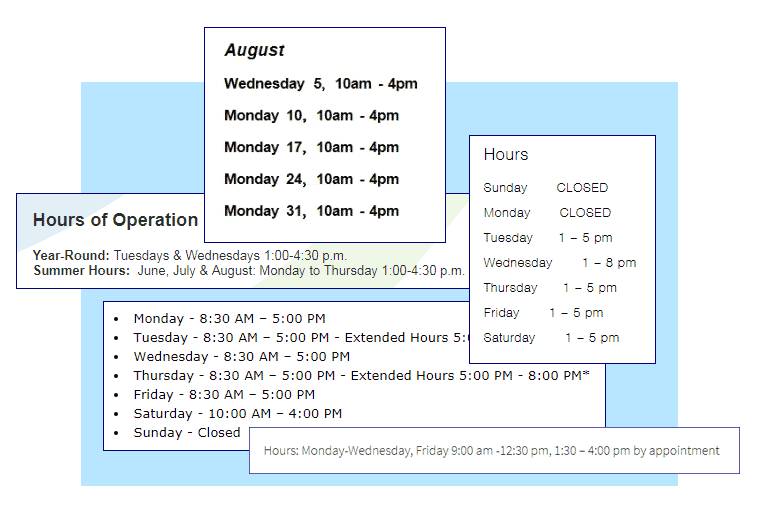 These public hours appear on the websites of various-sized archives here in Ontario. Hours range from one or two days a week, to afternoons only, to six days a week. Searching for information in the age of the Google search box tends to be about instant info-gratification. Archival research doesn’t work like that. We’ve already outlined the extra steps you might need to take to use archival material. But beyond that, the people who created the records held in archives weren’t necessarily thinking of us or our research questions: they were simply documenting whatever they were doing at the time. To use their records to answer your questions you may need to piece together a few (and sometimes many) archival sources. Some records are slower to view than others. 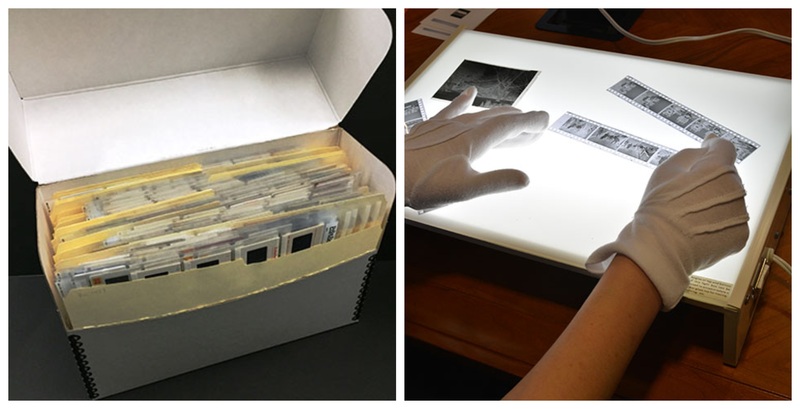 It will take a while to go through these slides and negatives using a light box. True, occasionally archival research will yield a quick hit; but more often it’s a slow sifting of lots of records looking for interconnections – rather like prospecting for gold in a field. The advantage of this is that while you may not find the gold you’re looking for, you’ll put yourself in the way of other serendipitous findings. In fact, some researchers come to relish the process of allowing records to speak to them – a kind of dance between focus and flexibility. The important thing is that archival research is always a bit of a gamble: while archivists can point you in the direction of likely places to dig for your gold, they can’t do all the digging and they can’t guarantee that you’ll hit a rich vein. Trying to use archival records to answer a big, broad question that has already been thoroughly investigated. Archival records aren’t an efficient introduction to a large well-understood topic; say, the entire history of a town. For a bird’s-eye view of big topics, first consult published sources (like books). The first person to write a comprehensive history will have gathered and synthesized information from archival resources. Don’t reinvent the wheel if you don’t need to. If you ask an archives to retrieve every record they have on a huge topic they’ll certainly ask you to narrow down your request intitially. Expecting that an archival record necessarily exists that will answer a highly specific question. Yes, archival records usually document very specific circumstances; this is precisely why one might not exist that exactly answers your question (even if it seems to you a simple question). You may well need to piece together evidence from several sources. And sometimes there is no available answer: archives only hold what remains, and we have no time travellers on staff (or do we…?). Expecting that archivists will know historical facts “off the top of their heads.” We admit it, we know a lot. But we haven’t memorized the contents of all our files and boxes. Not budgeting enough time or leaving things too late. The archives isn’t an ideal place to drop by a few days or hours before a deadline. The more records you’ll need to peruse the less feasible some quick research becomes (some archival collections comprise hundreds of files or boxes). We appreciate that circumstances can arise unexpectedly but start archival research as soon as you can. Arriving at an archives on a day when it isn’t open. You don’t want to do this. Check on hours ahead of time. Our public spaces in archives tend to be fairly quiet as researchers get on with reading and thinking. But even when the reading room looks serene, the working lives of archives staff are busy. Besides the numerous activities involved in our specialized work, we also deal with the normal round of workplace business like attending meetings, writing reports, compiling statistics, and planning budgets. What does our workload mean for you? Again, check us out ahead of your visit before walking in. Remember to do your own remembering (note down what records you use for, example). Our brains are already crammed with facts and figures. Asking us what photo you may have seen last year (or last week) may not get you very far. Communicate with us as concisely and precisely as you can. We appreciate hearing the crux of what you need and a little context. But sending us many unsolicited pages of background to your research may slow us down in trying to help you. Your patience is always appreciated, whether you’re waiting for records to be retrieved or when we’re helping someone else. Here are the major types of work involved in reference. As with working with the archival collections themselves, all these processes unfold in great volumes. 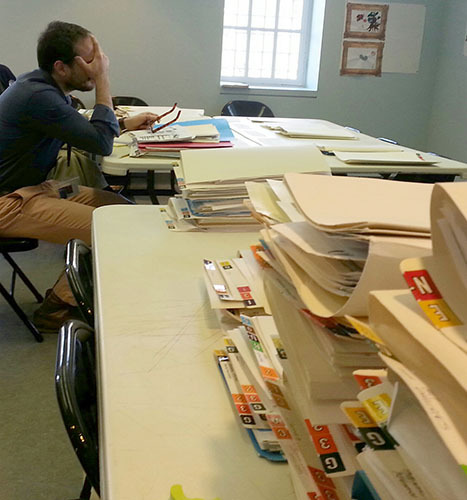 Intellectual labour: As the human faces of archival collections, archives staff need to think quickly and creatively. Some archives manage online searchable databases and help inquirers to use them. In other archives, staff are the first interface between inquirers and collections. 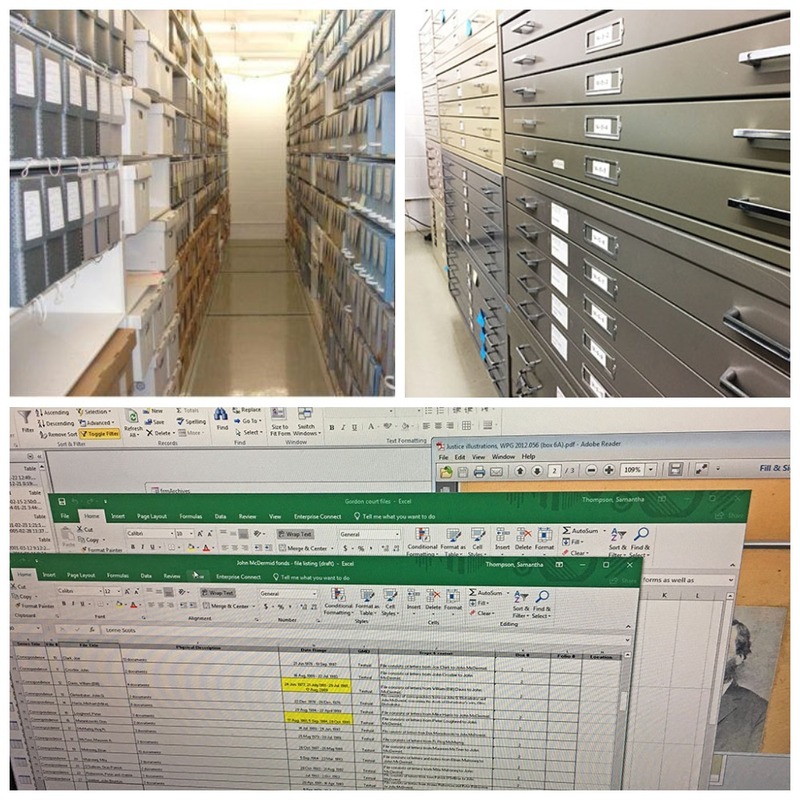 The work of archivists creates links between the archival records in storage (above) and information about what and where those records are (below). In other words, people are the way into the archival world. 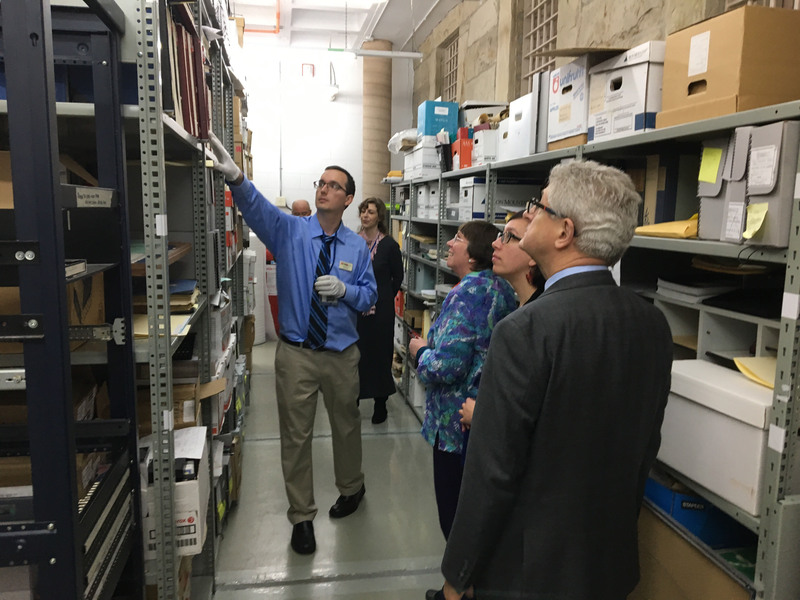 In either case, archives staff juggle multiple internal databases, inventories, lists, and the considerable contents of their own minds (gleaned from working deeply with collections). This activity isn’t as simple as plugging keywords into search boxes and pulling up a digitized record. For one thing, most records still aren’t digitized (and some may never be). 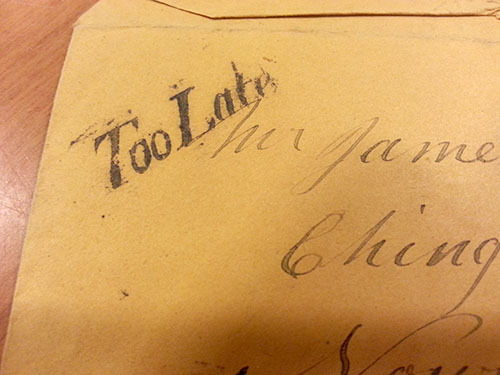 For another thing, most archival documents are not catalogued at an item level. We therefore need to be able to direct researchers to potentially useful groups of records they can look within. Simply because we deal with a multitude of subjects, we build up a wide general knowledge. Many archivists also become subject specialists on primary sources in particular fields. Administrative labour: We’re always dealing with more people than it might appear. We keep track of voluminous communications and schedules. Because each archives holds documents that are one-of-a-kind in the world, we often hear from researchers far away. Many smaller archives also maintain an appointment booking system. Onsite researchers need to be registered (keeping personal information secure) and oriented to the archives. Staff also need to negotiate several types of legislation when providing (and, yes, sometimes not providing) access to archives: we need to know and apply privacy law, donor agreements, and various types of intellectual property law. The records retrieved here for a relatively simple research request weigh over 120 lbs. A busy day with lots researchers means lots of lifting. The recent past is still largely a paper one, and paper is heavy. Physical labour: Archival work is a unique combination of the cerebral and the physical. Manual labour can include heavy lifting, climbing, and repetitive movements. Paper is particularly heavy in aggregate (especially within some of the older binding formats). Some large archives have specially equipped staff who handle all retrievals from storage. Workers in small archives usually have a lot of lifting to do among their other tasks. Interpersonal labour: Archives work is people work. This isn’t just because archives are ultimately all about people. Listening closely, maintaining diplomacy and tact, asking the right questions to help someone identify the way forward, asking enough questions without being invasive: all of these qualities are essential to reference work. We don’t just need to know about collections, we also need to know how people think and express themselves and how they search for and absorb information. Archives workers do a fair bit of informal and formal teaching. Archives are unfamiliar to many people and a lot of our time is spent explaining what archival records are, how they can be used, and how archival institutions work. Lastly, the personal nature of archival material (as well as of working with the public) means archives workers often deal with vulnerable people and delicate situations. Archives workers need to cultivate sensitivity, discretion, kindness, and lots of patience. Technical labour: More than ever reference work relies on technological savvy. Technical skills are especially required of archives staff who are dealing with requests for electronic documents or for digital reproductions of audiovisual material. We’ve already seen that it’s not realistic to expect archives staff to tell you how long your research may take, whether certain records will reward the time you put into them, or what you may have consulted during a past visit. Interpreting records can be subjective: our view might differ from yours. You may notice aspects of documents we wouldn’t, based on your concerns and prior knowledge. You are and should be the expert in your own research. If archivists did everyone’s research, we would do little else. We certainly wouldn’t be doing any of the other things that are necessary to acquire records and make them useable. Since archives (and archivists) are all different, there are some caveats here. Archivists are sensitive to the challenges of distance research. Some archives may offer quick look-ups within a variety of straightforward records for free or for a fee. (Don’t be surprised, however, if what you might think is a quick look-up actually isn’t.) However, many archives aren’t able to do research on your behalf at all and may refer you to a list of local freelance researchers. As well, sometimes the line between your interests and ours can blur because archivists are often subject experts. If you are lucky enough to benefit from juicy leads, canny connections or otherwise special knowledge that only an archivist could have known, take this as a welcome bonus. Most of us who work in archives strive to put ourselves in the shoes of researchers. We too know the joys and frustrations of archival research. And we know that the information hunt is often invested with a lot of personal meaning or practical significance. We’re grateful when archives users are likewise sensitive to our own work conditions and general human frailty, especially when we’re multitasking (which we almost always are). We get hungry; we forget things; some of us are naturally more sociable than others; we get tired both physically and mentally; we need breaks. We deal with the idiosyncrasies of facilities that aren’t completely under our control. We also deal with the standards of our profession which are under our control, and for good reason. On this note, it’s always helpful to remember that someone else’s job always looks different from the outside than from the inside. Some of our tasks may superficially resemble things you might do everyday, like putting paper into files or scanning a photograph or answering a phone call. Take time to consider that the people working in archives are skilled professionals for whom such tasks have layers of complexity. Matters like the requirements of intellectual context, long-term preservation, or privacy considerations mean that we have good reasons for our practices. Archives workers mostly welcome questions about our processes, practices, and policies – after all, it gives us a chance to help people understand what we do and why it’s important, both for the present and the future. We appreciate both your support and the great privilege of participating in your archival adventures and discoveries. We’ll finish up with a handy summary of how you can help us to help you. Image of City of Toronto Archives is used under a Creative Commons Attribution-Share Alike 3.0 licence. Wow – you’ve covered a lot of great information here. I am going to repost it on my site so more people can benefit from it. Thanks! Thanks for sharing and great to discover your site!